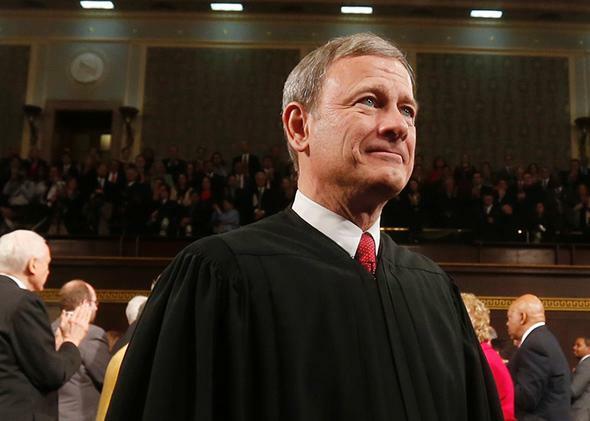 SCOTUS end of term: Is Roberts casual about the truth in the campaign finance case McCutcheon? Does Chief Justice John Roberts show a certain casualness about the truth? Presidents no longer seem to consider the management role of the chief justice a factor to be considered in picking one. Above, Chief Justice John Roberts. The first question I address is whether the Supreme Court is well-managed. I have my doubts. The court has a rigid deadline of the end of June for issuing decisions. This is strange, especially when the deadline is so close to the conferences in April at which the court’s last cases for the term are voted on and assigned. Why not make the deadline the beginning of the following term? Are the Justices so averse to doing a little work during the summer? And then there is the oddity noted by Adam Liptak in a recent article in the New York Times: It takes up to five years for a decision by the court to be published in the official Supreme Court case reports, during which mysteriously protracted interval the justices apparently feel free to make changes in their opinions, and to do so rather surreptitiously. The chief justice is the administrative head of the entire federal judiciary, which includes not only the lower federal courts but also a rather elaborate administrative apparatus (the Administrative Office of the U.S. Courts) and a major research/training institution (the Federal Judicial Center). Yet the impression one gets is that chief justices take little interest in anything other than their own court, the Supreme Court. Chief Justice Warren Burger was an exception, though probably one has to go back to Chief Justice Charles Evans Hughes, who retired in 1941, to find a chief justice who had significant leadership and management skills. (He had a most remarkable CV: practicing lawyer, law professor, secretary of state, presidential candidate, member of the Court of International Justice.) Odd that presidents no longer seem to consider the management role of the chief justice a factor to be considered in picking one. It’s true that Hughes himself set the end of June deadline, but he did that to rebut charges that the justices were too old and slow to do their work properly. That was the era of struggle between FDR and the court. The deadline is the fossil remnant of a vanished time. The other question I want to address is whether justices, and judges more generally, feel obligated to state in their opinions only things they believe. Because appellate courts are committees, a judge is frequently obliged in a spirit of compromise to include, in an opinion of which he is at least the nominal author (for nowadays law clerks at all levels of the federal judiciary play a huge role in opinion drafting), a proposition that he may be skeptical of, that he would not include if a colleague didn’t want him to include, yet that he would not consider an actual falsehood. What is worrisome to me is what I sense in some judges as a certain casualness about truth, which I trace to legal training and practice. Patrick Devlin, the distinguished English judge, once said that the function of a lawyer in litigation is to say on behalf of his client what his client would say if the client were learned in the law. But the client presumably would have few if any compunctions about lying if it would advance his cause. I don’t think Devlin meant that the lawyer should lie on his client’s behalf, but legal training and practice do tend to blur the line between truth and falsity. The lawyer is an advocate, an agent; his commitment is to win for his client. He may be reluctant to say something he knows to be a lie, but he may state as truth what he doubts is true though does not know to be false. And if he becomes a judge or justice he may have difficulty sluffing off the old habits.